At Enventys Partners, the design process is a critical aspect of every product development project we undertake. Our expert engineers and model-makers work in tandem with our industrial designers to create flawless prototypes and products using state-of-the-art equipment and high quality materials. Part of understanding how we make our products is understanding the types of materials we use. Below we walk through a few of the options to give a better understanding of how we build products using technical soft goods. Only the laser beam itself touches the fabric. This contactless process minimizes skewing and fabric distortion since there is zero resistance or pressure. Cutting fabric with a laser allows for extremely accurate cuts without ever touching the fabric, and no unintended marks are left on the fabric in the process. It’s almost impossible to to have consistent cuts with conventional methods – lasers achieve a precise cut every time. When laser cutting synthetic materials, the edge is sealed from the laser which prevents fraying of fabrics eliminating the need to hem. 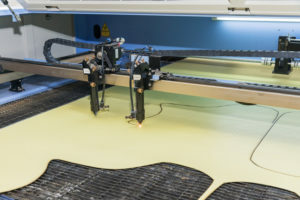 Materials often used in laser cutting are polyester, aramid, Kevlar ®, fleece, cotton, polypropylene, polyurethane, fiberglass, spacer fabrics, felt, silk, filter fleece, technical textiles, synthetical textiles, foam, fleece,velcro material, fabrics, knitted fabrics, meshwork, plush and polyamide. Laminated textiles consist of one or more layers of textile and component. The layers are bonded closely together by an added adhesive, or one of the component layers may have adhesive properties binding the layers. This adhesive creates a strong bond, which will not deteriorate from end-use conditions such as movement and laundering. Technology has improved greatly, making the adhesives strong yet flexible, which is ideal for performance clothing where comfort is paramount. Traditionally, many adhesives have been associated with making the fabric too rigid and negatively affecting the hand. High performance apparel that requires garments to be waterproof and breathable use a laminate membrane. Laminate membranes often have a non-textile microporous membrane that is sandwiched between an outer shell fabric and inner lining that is next to skin. Lamination can also be used on the fabric surface to create visual interest like logo holograms or textures that do not have a functional purpose. Laminated textiles have applications in medical, military, industrial, marine, automotive, home decor, food, performance and protective apparel industries. Hot melt lamination is the environmentally-prefered method. 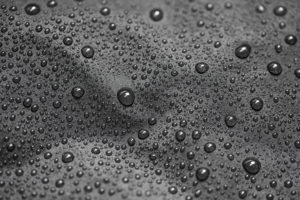 Hot melt is a two step process: the application of a thermo-set adhesive, and the fusing of the fabric and the non-textile component by heat and pressure. Adhesive is applied either to the whole surface, or in a “discreet” method in patterns, such as glue dots which provide greater flexibility. The process of compression molding begins with heating the material, then placing it into a temperature-controlled cavity mold where pressure is applied to shape the material. Typical materials used are PVC foams, open cell urethanes and fabrics laminated to both sides of the foams. Fabrics can range from polyester, nylon, textured faces or loops depending on the end use. Compression molded soft goods are used in a wide range of applications, from medical, military, sport and outdoor to accessory products. This process allows an addition of a high degree of functionality, where foam type and varying fabric can be combined to make the product unique to its end use. 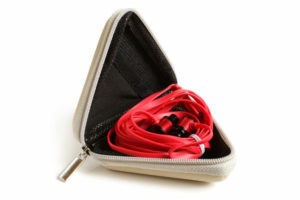 A compression-molded soft good is a semi-rigid structure that can provide protection for items from impact and environmental factors, such as a case for sunglasses or headphones. This technology allows for the product to be molded to exact dimensions with a smooth, contoured finish. Hardware and inserts can be added for visual appeal, while functionality and custom fit is important for the end use components. Want to learn more about how we build prototypes? Look for an upcoming blog post about how we use hardgoods.